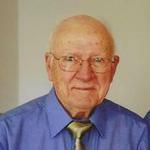 Howard W. Leedy age 92 of Ashland, passed away Sunday March 27, 2011 at Hospice House. Born on December 26, 1918 in Pavonia Ohio the son of Otto and Ella (Swinehart) Leedy he had be an Ashland resident all of his life. Mr. Leedy was employed as a Stationary Engineer with the Columbia Gas Company. On May 1, 1938 he was married to Betty Morr who preceded him in death in December of 2007. Mr. Leedy is survived by two sons and daughters in law, Carl and Sandra Leedy and David and Sue Leedy all of Ashland. Also surviving are two daughters and one son in law, Carol and Ernest Taylor of Colorado Springs Colorado and Barbara Jones of McKinney Texas. Eleven Grandchildren and Thirteen Great-Grandchildren also survive. In addition to his wife Betty, Mr. Leedy is preceded in death by his parents and two sisters, Velma Boyer and Irene McCane. Mr. Leedy was a member of the Trinity United Methodist Church. A private family service will be held at the Trinity United Methodist Cemetery with Dr. Ernest Taylor officiating.